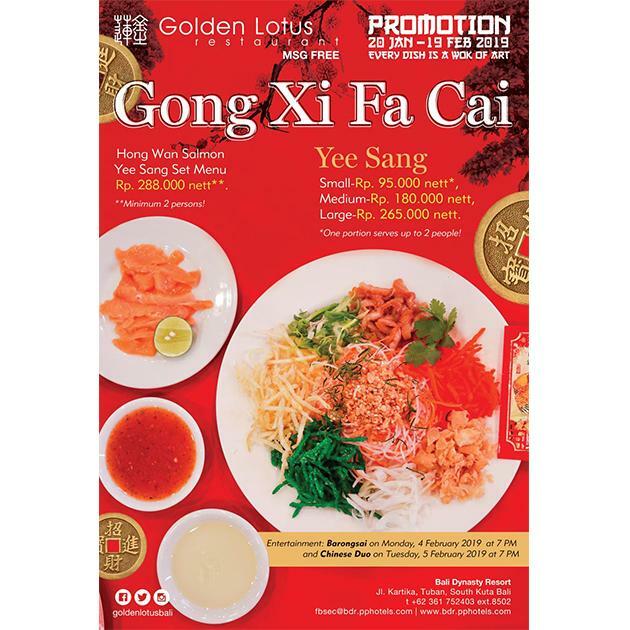 Golden Lotus Chinese Restaurant, an award-winning Chinese restaurant at the Bali Dynasty Resort, invites the diners to celebrate the coming Chinese New Year with an extra special menu. The restaurant will offer a selection of Chinese New Year themed dishes, such as YEE SANG—a crispy salad traditionally tossed and shared during this auspicious holiday season as a symbol of prosperity. This particular dish is available for only IDR 95.000 nett per small portion (2 people), IDR 185.000 nett per medium portion (4 people), and IDR 260.000 nett per large portion serving up to 6 people, ensuring that each option is great value for money. In addition, the restaurant’s popular Chinese New Year set menu—the Hong Wan Salmon Yee Sang—is also making a comeback. It offers diners an extensive feast consisting of Yee Sang salad, chicken, duck and prawn options, fried rice, soup and a delicious mango pudding for dessert. The set menu is priced at just IDR 288,000 nett per person for a minimum 2 people. To welcome the Year of the Earth Pig in style, there will be a colourful Barongsai performance and a Chinese singer to entertain diners on the 4 th & 5 th of February 2019 from 7PM onwards. All promotions will be available exclusively for lunch and dinner from the 1 st to 9 th February 2019. Plan your visit to Golden Lotus Chinese Restaurant now as it is neither too early nor too late to celebrate Chinese New Year with flavourful food believed to bring good luck and happiness.